Now that the classes, assignments, and tests that comprise an academic year have come to a close, kids are ready to embrace the summer break and all that it entails with open arms. But are you ready? Unless you have a summer technology contract, you may not be. The only problem is that many of them may wind up spending more time glued to their smartphones, computers, and televisions than focused on outdoor recreation, visits to popular tourist attractions, and quality time with family and friends. According to the American Academy of Pediatrics, too much screen time can put children at risk of obesity, sleep problems, risky behavior involving issues like substance abuse and eating disorders, cyberbullying, poor performance in school, and more. The same source notes that close to 75% of teenagers own a smartphone, 25% of teens say they are “constantly” using the Internet, 76% of teenagers use one or more social media sites, and four out of five households have a device used for playing video games. A study by Common Sense Media indicates that kids up to eight years old spend an average of two hours and 19 minutes daily using screen media — and 72% of that time is dedicated to watching television and videos. Consider that in 2011, the average time kids spent on screen media was one hour and 55 minutes. 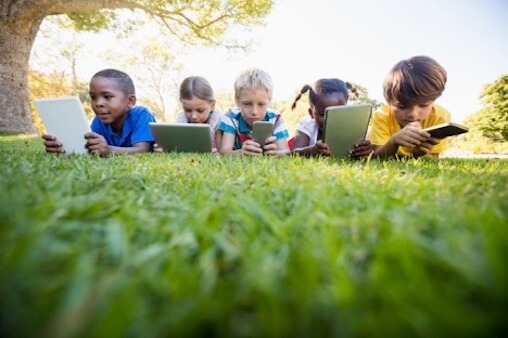 A summer technology contract can be a useful tool to prevent kids — and their parents, for that matter — from spending too much time in front of a screen during the summer months,. Such a contract — more below — will ensure that family members know their rights and obligations. It can be easy to figure that a summer technology contract is only for kids who can’t keep their hands off of their smartphones, but such a pact needs to include everyone in the household. It’s best to sit down as a family and work on the contract as a group. That way, everyone’s views can be taken into account to hammer out an agreement that everyone can live with. The contract needs to limit the amount of time that everyone in the family spends accessing media from their smartphones, tablets, TVs, and other mobile devices. In addition to limiting how much screen time family members can rack up, the contract should stipulate that other activities should be pursued after a certain amount of time spent accessing media. Things like playing outdoors, exercising, and reading books are examples. Consider adding a section to your summer technology contract that outlines fun family activities like going on a picnic in the park, visiting a nearby lake or seashore, going to a museum, or taking a family bike ride. Use these ideas to plan outings in advance so kids have something to look forward to doing as an alternative to screen time. The contract should also stipulate when smartphones should not be used. In our family, we make the dinner table a “no-phone zone”. You may want to include other specified family time, too. When it comes to children, technology should be considered a privilege rather than a right. The contract should, therefore, explain the proper use of social media, mandate that only useful and respectful content be accessed, require that children refrain from giving out personal details to anyone online and that they report anything or anyone suspicious to their parents. Parents may also want to implement some sort of monitoring solution in a bid not only to keep children safe, but also to encourage responsible behavior. In the interests of transparency, the use of any monitoring software should be specified in the contract after parents have had an open and frank talk with their children about the need to track screen time usage. Sign Your Summer Technology Contract, Revisit It, and Revise It! Once the contract has been drawn up, ensure that everyone in the family signs it to signify their adherence to the contract. Also, be sure that there are reasonable penalties if anyone violates the contract. But parents should not view the contract as a final document. It should periodically be updated — with consultation and feedback coming from everyone in the family — so that it continues to be up to date and relevant with regards to the internal family dynamic. With so much to see and do outside your home, there’s no excuse to spend time cooped up in a house staring at screens all day long. But it happens far too often. Excessive screen time does no one any good, so head out with the family to explore some of the sites and sounds that your city has to offer.